Once again one of our customers asked us to make something like this –we did! And so the Darkfae Skirt was born! 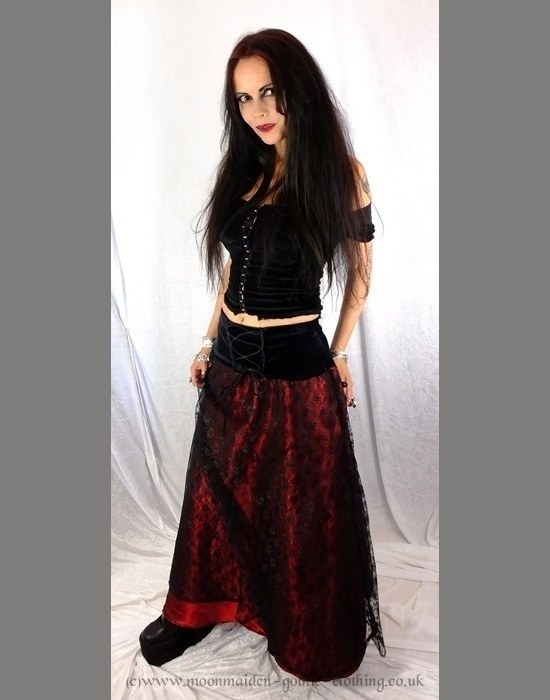 <br> <br> With an elasticated steamed velvet waist, with a corset fastening made from braided looping and laced with cord; the lower part is made from gorgeous bias cut taffeta overlaid with lace so they both fall beautifully.. It’s light, it’s floaty, it’s gypsygoth! It's shown here in Black and Claret - see below for more colour options! Once again one of our customers asked us to make something like this –we did! And so the Darkfae Skirt was born! With an elasticated steamed velvet waist, with a corset fastening made from braided looping and laced with cord; the lower part is made from gorgeous bias cut taffeta overlaid with lace so they both fall beautifully.. It’s light, it’s floaty, it’s gypsygoth! It's shown here in Black and Claret - see below for more colour options!